Cure Medical Cure Ultra® Coude Catheter Ready To Use. Blue control strip for insertion accuracy! Download Clean Self Intermittent Catheterization Guide for Men.pdf. 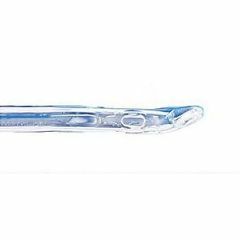 The Cure Ultra® Coude Catheter for Men is a high quality DEHP and latex free product that always has fire polished eyelets that are smooth and less irritating. The sterile, single use Cure Ultra™ is a ready-to-use catheter for men with all of the convenience of pre-lubrication, but WITHOUT THE DRIP or mess. The Cure Ultra® Coude is offered with polished eyelets on a pre-lubricated coude tip and a unique, ‘No Roll’ connector/funnel end. Plus, the Cure Ultra® Coude won’t kink if you bend it, and a case weighs less than our traditional hydrophilic! The convenient blue control strip allows for insertion accuracy. Additionally, it includes a unique gripper sleeve for increased ease of use. The Cure Ultra for men is offered in 16” length,12FR -18FR. Why choose a coude catheter? Some men have very tight sphincters or an enlarged prostate which makes it difficult to pass the catheter into the bladder. A catheter with a special, curved (Coude) tip may make passing the catheter easier. If a catheter with Coude tip is needed, your doctor or nurse will show you how to use it. Cure Medical donates 10% of net income to medical research in pursuit of a cure for spinal cord injuries (SCI) and central nervous system disorders (CNS/D There are many ideas to find a cure, but without funding, nothing will ever happen.